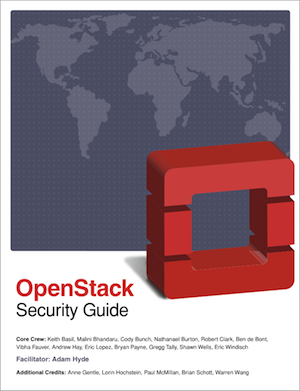 The OpenStack Security Guidebook has been published in ePub format (with PDF and online to follow shortly). Companies and organisations involved include Red Hat, HP, Nebula, the NSA, Intel, Nicira, Rackspace, Cloudscaling, Johns Hopkins Applied Physics Laboratory and Floss Manuals. As OpenStack adoption continues to grow and mature, security has of course become a priority. This guide has been written to provide an overview of security best practices, guidelines, and recommendations for increasing the security of an OpenStack deployment. “The authors of this book were some of the most talented OpenStack, security, and compliance individuals in the industry,” said Andrew Hay, director of applied security research at CloudPassage, Inc. and (somewhat immodestly) a contributor to the book himself. The authors say they bring their expertise from deploying and securing OpenStack in a variety of environments. “As with the OpenStack Operations Guide, we followed the book sprint methodology. The book sprint process allows for rapid development and production of large bodies of written work,” said the team, in a press statement. The team converged in Annapolis, Maryland to write the guide due to the close proximately of some key members of the group.